In this cohort study, we intend to evaluate the various clinical and biochemical factors that correlate with the prognosis and immediate outcome of an admitted adult patient of CM. Predicting a CM with poor prognosis will salvage both resources and time in these resource-deprived forests. Health services in the area include two THCs assisted by 6 tribal outreach ambulatory clinics which serve 16 tribal settlements in the Chakrashila forest. The referral hospital was the Rup Nath Brahma Civil Hospital that served the entire Kokrajhar district and also the adjoining forests. The THC is a 12-bedded indoor facility equipped with all major intravenous (i.v. ), intramuscular (i.m.) medications and basic resuscitation facilities. Of all, 38 patients requiring advanced ventilatory support were transported to the Rup Nath Brahma Civil Hospital for critical care and data was followed up through discharge summaries and hospital records. All anti-malarial medications were available at the aforesaid hospital. A total of 112 adults (>12 years) were included in the study. They comprised of 73 males and 39 females with CM admitted to the Bandarpara and Damodarpur THCs between March 2011 and November 2013. Patients were either detected in comb operations in the forest settlements or enrolled directly to the THC. Cerebral malaria was taken to be the admission criteria according to the WHO definition : a0 person with coma persisting for more than 30 min after a generalized convulsion and with confirmed P. falciparum asexual parasitemia. However, cases of P. vivax with altered sensorium were also included in the study due to recent reports of rise in vivaxcerebral malaria. All other causes of the altered sensorium viz., meningitis, encephalitis and postictal state were diagnosed clinically and with lab tests and excluded from the study. On admission, the demographic characteristics, symptoms, previous medical history and results of physical examinations were recorded. To quantify the depth of coma, Glasgow coma scale (GCS) score of <9 was taken to be coma and 5 or less was taken to be deep coma. Neurological and detailed fundoscopic examinations were done at admission and during discharge. A sample of 5 ml of blood was drawn for examination using IV cannula. The diagnostic methods used to detect malarial parasites were conventional thick and thin peripheral blood smears stained with Giemsa. The slide was considered negative when there were no parasites in a 100 high-power field. The parasite density was calculated against 200 white blood cells (WBCs) using the formula: Parasite density (parasite/μL of whole blood) = (Number of parasites counted/WBC counted) × WBC count/μL. PCR studies targeted against the 18S ribosomal RNA gene were done only on the 38 patients referred to higher centers for identifying the exact genus of infecting plasmodia. The primer sequences were modified for this study: 59-ATCAGCTTTTGATGTTAGGGT ATT-39, genus-specific; 59-TAACAAGGACTTCCAAGC-39, P. vivax-specific; and 59-GCTCAAAGATACAAATATAAGC-39, P. falciparum-specific. Each sample was subjected to a minimum of four rounds of PCR. Using on admission values, severe anemia was indicated by a hemoglobin (Hb) <5 g/dl, acute renal failure by a serum creatinine >3 mg/dl, jaundice by a serum bilirubin >3 mg/dl, hypoglycemia by a blood glucose level <40 mg/dl and lactic acid was taken as significant above 45 mg/dl. The retinal findings were documented by direct ophthalmoscopy, performed shortly after admission on administration of a topical mydriatic [Figure 1]. Retinal whitening, vessel changes and retinal hemorrhage are diagnostic of malaria. Papilledema was noted; however, taken alone it is not diagnostic of CM. Retinal whitening occurs as less bright mosaic patterns found specifically in central temporal macula and fovea. Vessel changes are commonly seen in peripheral fundus esp. branch points and involve orange or white discoloration of the vessels instead of red. White-centered intraretinal blot hemorrhages similar to Roth spots are found in CM. Mortality and discharge summaries were documented. The patients were treated with quinine. It was initially given intravenously and then orally, once the patients regained the ability to swallow. For the IV treatment, a loading dose (quinine 20 mg/kg, diluted in 10 ml/kg 5% dextrose) given over a period of 4 h followed by maintenance doses (quinine 10 mg/kg, diluted in 10 ml/kg 5% dextrose), each given over a period of 4 h, every 8 h. Subsequently, oral quinine (10 mg quinine sulfate/kg) was given every 8 h, to complete a 7-day course of treatment. Data entry was carried out in MS excel sheet and analysis was done using SPSS 19.0 version. Tests such as Chi-Square and independent sample t-test were performed as test of significance. P value < 0.05 shall be considered as significant. Logistic regression model was used to find the prediction of death among subjects. Out of 112 patients of CM, 65% were male; with ages ranging from 15 to 77 years. The age groups comprised of 13-20 (8%), 21-40 (38%), 41-60 (36%) and >60 years (18%). The patients belonged to the following tribes - Bodo (63%), Dimasa (10%), Sonowal (15%) and Turung (12%). Of all patients, 50% presented with vomiting, 56% with visual disturbances, 34% with headache, 38% with jaundice and 31% with prior seizures. About 47% had hypotension along with signs of circulatory failure and 38% had profound coma with GCS <5 [Table 1]. Coma lasted from 2 to 32 h before recovery or death. Patients with coma <3 h recovered or were alive with neurological deficit In 35% patients coma lasted for more than 8 h and they developed some form of neurological sequelae or died. About 21% of CM patients had hepatomegaly, 28% had splenomegaly and 29% of patients had meningeal irritation in the form of neck stiffness. Malarial retinopathy is the most sensitive indicator of CM. Retinopathy presents as retinal whitening, vessel aberrations, or retinal hemorrhage. These findings can present together with papilledema. Of all, 51% had normal fundoscopy finding, 12% had papilledema alone, 16% had only retinal hemorrhage and 17% had both papilledema and retinal hemorrhage. In the laboratory work-up, 26% of CM patients were severely anemic (Hb <5), 13% had severe thrombocytopenia (platelets < 50,000/μL), 58% of patients had elevated serum lactate (>45 mg/dl), 28% had serum bilirubin >3 mg/dl and 27% had serum creatinine >3 mg/dl [Table 2]. Parasite density had statistically significant association with CM and case fatality. We found that 46% of CM patients had parasite density of >500,000/μL with case fatality rate of 59.62%. CM is commonly associated with P. falciparum. Our study also found few cases suffering from CM due to P. vivax exclusively. 78% had CM due to P. falciparum and 22% due to P. vivax. Mortality was 33% in P. falciparum and 32% in P. vivax. In P. falciparum CM, neurological sequelae were observed in 51% and full recovery in 16%. In P. vivax CM, neurological sequelae were observed in 16% and full recovery in 52%. The mortality rate and neurological complications rate in patients with retinal whitening was 38.46% and 23.07%, with vessel changes was 25% and 18.75%, with retinal hemorrhage was 55.55% and 11.11%, and with hyperlactatemia was 53.85% and 18.46% respectively [Table 3]. There were three deaths observed in patients with papilledema alone. 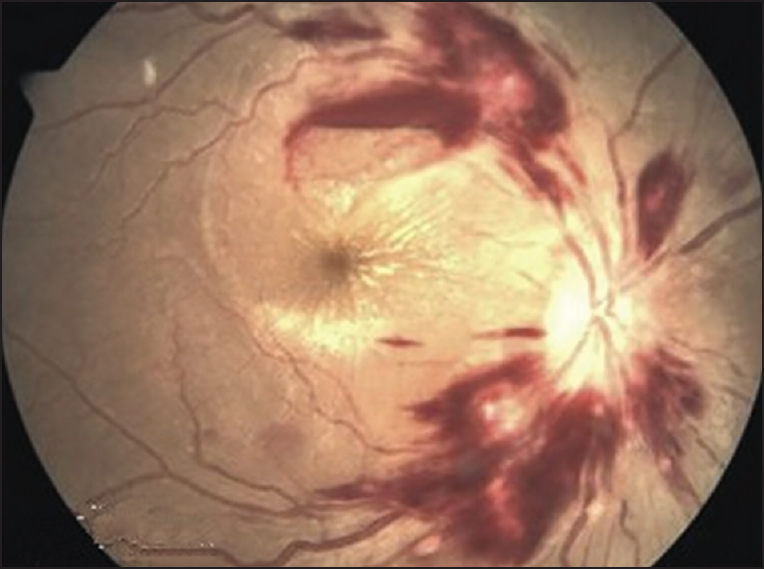 Patients with combined papilledema and hemorrhage were admitted for a period of 5-10 days whereas those with retinal hemorrhage alone were admitted for 9-12 days. 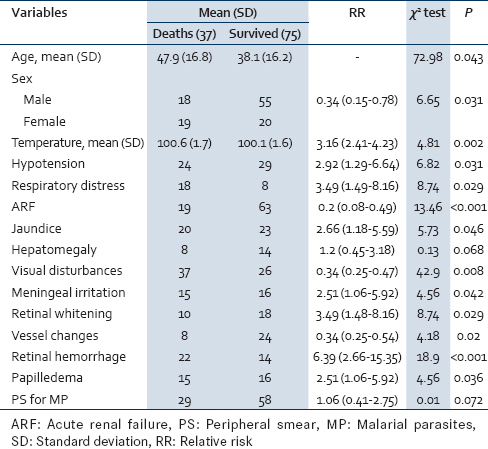 Papilledema in CM was found to be independent of the other signs of malaria retinopathy in predicting death. Our study suggests that this malarial retinopathy can be used to identify prognosis of adult CM, as has already been established in children. About 54% of patients with serum lactate >45 mg/dl died, 18% developed neurological defects and 28% fully recovered. Our study corroborates the important prognostic significance of serum lactate with high mortality in CM. Case fatality rate of our study is (37/112) 33.03%. Out of 112 patients, 16.07% (18) developed neurological sequelae and 50.89% (57) fully recovered without neurological defects. Correlation of independent findings with outcomes is summarized in [Table 4]. Our study focuses on the prognostic significance of serum lactate, malarial retinopathy and parasite density in CM. The study provides data about P. falciparum and P. vivax CM in the tribal areas of Kokrajhar, Assam. The case fatality rate of CM has been determined in the tribal setup. The prognosis and outcome in terms of duration of hospitalization, depth of coma, neurological sequelae, full recovery and death has been studied in depth. The neurocognitive outcomes could not be studied due to lack of questionnaires in the local tribal languages. The case fatality rate of CM (33.03%) of our study was significantly higher than previously reported studies which were around 13-22%. ,, The reasons include late reporting of the patients, paucity of advanced treatment options for critically ill patients, poor connectivity to the tertiary care center, problems with transportation facilities and socio-cultural inhibition toward contemporary medical practices. Our study substantiates the evidence of high parasite density associated with CM. We also conclude that the case fatality rate is higher in patients with raised parasite density (more than 500,000/uL). This can be explained by increased amount of cytoadherence by parasitized erythrocytes, which results in raised lactate and higher mortality due to vascular pathology. Clinical data provided by Kochar et al. indicates that P. vivax can cause both sequestration-related and nonsequestration related complications of severe malaria, all of which are commonly associated with P. falciparum infections. Of the 38 patients referred to the higher center for critical care, 12 had P. vivax mono-infection, 21 had P. falciparum mono-infection and 5 had mixed infection. This is the highest number P. vivax CM cases reported in any study from India till now in adult cases. Kochar et al. reported 14 cases of CM out of 154 pediatric cases admitted for P. vivax malaria. Our study validates the previous study and hence shows that P. vivax can be responsible for adult CM. This demonstrates the need for change in the WHO definition of CM which concentrates only on asexual stage of P. falciparum (and not P. vivax) in blood smear. Our study was undertaken with the intent of initiating more clinical research in tribal setting in Assam. The data will help in learning the shortcomings of health care set up and using serum lactate and retinopathy findings for determining the prognosis of patients. It will also help in using the limited supply of antimalarials and referral services judiciously. Our study addresses major hurdles while doing research in tribal areas such as geography, language barrier, resource limitation and lack of intensive care facility. We recommend further randomized case-control studies to evaluate these prognostic factors. Retinopathy subsets such as whitening, vessel changes, hemorrhage and lactic acid levels should be studied in depth to create a prognostic classification. Since neurocognitive outcome could not be evaluated due to lack of questionnaires in local tribal language, further studies are recommended in this accord. Our study demonstrates a strong correlation between retinal changes (whitening, vessel changes and hemorrhage) and a poor outcome of CM. Combinations of high parasite index, severe hypoglycemia, hyperlactatemia, retinal findings and longer duration of deep coma can be used to identify the prognosis in terms of neurological sequelae, duration of hospitalization and those with higher risk of death. Role of P. vivax mono-infection as a rising causal factor for CM needs to be further evaluated in view of significant number of deaths due to complicated vivax malaria. Dev V, Sharma VP, Hojai D. Malaria transmission and disease burden in Assam: Challenges and opportunities. J Parasit Dis 2009;33:13-22. Dev V, Phookan S, Sharma VP, Dash AP, Anand SP. Malaria parasite burden and treatment seeking behavior in ethnic communities of Assam, Northeastern India. J Infect 2006;52:131-9. Sarkar S, Bhattacharya P. Cerebral malaria caused by Plasmodium vivax in adult subjects. Indian J Crit Care Med 2008;12:204-5. Pal PK, Vengamma B, Naik KR, Saroja AO. Prognostic factors in cerebral malaria: A study of 80 cases. J Neurol Sci 1997;150:S131. Kochar DK, Shubhakaran, Kumawat BL, Kochar SK, Halwai M, Makkar RK, et al. Cerebral malaria in Indian adults: A prospective study of 441 patients from Bikaner, North-west India. J Assoc Physicians India 2002;50:234-41. Dev V, Hira CR, Rajkhowa MK. Malaria-attributable morbidity in Assam, North-eastern India. Ann Trop Med Parasitol 2001;95:789-96. Pardal MP, Bhalwar R, Mehta VK, Mahendraker A, Mehta AK. Malaria in Assam: A challenge. Indian J Community Med 2009;34:94-6. World Health Organization. Severe and complicated malaria. Trans R Soc Trop Med Hyg 1990;84 Suppl 2:S1-65. Tanwar GS, Khatri PC, Sengar GS, Kochar A, Kochar SK, Middha S, et al. Clinical profiles of 13 children with Plasmodium vivax cerebral malaria. Ann Trop Paediatr 2011;31:351-6. Kamble MB, Raut PP, Hussain ZF. Cerebral malaria in rural India. Indian J Pediatr 2002;69:659-61. Ozen M, Gungor S, Atambay M, Daldal N. Cerebral malaria owing to Plasmodium vivax: Case report. Ann Trop Paediatr 2006;26:141-4. Sattar MA, Hoque HW, Amin MR, Faiz MA, Rahman MR. Neurological findings and outcome in adult cerebral malaria. Bangladesh Med Res Counc Bull 2009;35:15-7. Shukla UK, Damle RK, Shukla MM, Singh N. Efficacy of alpha, beta - Arteether in children with cerebral malaria in forested tribal belt. Indian Pediatr 2002;39:565-8. Genton B, Al-Yaman F, Alpers MP, Mokela D. Indicators of fatal outcome in paediatric cerebral malaria: A study of 134 comatose Papua New Guinean children. Int J Epidemiol 1997;26:670-6. Walker O, Salako LA, Sowunmi A, Thomas JO, Sodeine O, Bondi FS. Prognostic risk factors and post mortem findings in cerebral malaria in children. Trans R Soc Trop Med Hyg 1992;86:491-3. Makani J, Matuja W, Liyombo E, Snow RW, Marsh K, Warrell DA. Admission diagnosis of cerebral malaria in adults in an endemic area of Tanzania: Implications and clinical description. QJM 2003;96:355-62. Severe falciparum malaria. World Health Organization, Communicable Diseases Cluster. Trans R Soc Trop Med Hyg 2000;94 Suppl 1:S1-90. Krishna S, Waller DW, ter Kuile F, Kwiatkowski D, Crawley J, Craddock CF, et al. Lactic acidosis and hypoglycaemia in children with severe malaria: Pathophysiological and prognostic significance. Trans R Soc Trop Med Hyg 1994;88:67-73. Taylor TE, Borgstein A, Molyneux ME. Acid-base status in paediatric Plasmodium falciparum malaria. Q J Med 1993;86:99-109. Allen SJ, O′Donnell A, Alexander ND, Clegg JB. Severe malaria in children in Papua New Guinea. QJM 1996;89:779-88. Cohen RD. The metabolic background to acid-base homeostasis and some of its disorders. In: Cohen RD, Lewis B, Alberti KG, Denman AM, editors. The Metabolic and Molecular Basis of Acquired Disease. London, UK: Baillière Tindall; 1990. p. 962-1001. Yayon A, Cabantchik ZI, Ginsburg H. Susceptibility of human malaria parasites to chloroquine is pH dependent. Proc Natl Acad Sci U S A 1985;82:2784-8. Marsh K, Marsh VM, Brown J, Whittle HC, Greenwood BM. Plasmodium falciparum: The behavior of clinical isolates in an in vitro model of infected red blood cell sequestration. Exp Parasitol 1988;65:202-8. Beare NA, Lewallen S, Taylor TE, Molyneux ME. Redefining cerebral malaria by including malaria retinopathy. Future Microbiol 2011;6:349-55. Lewallen S, Bakker H, Taylor TE, Wills BA, Courtright P, Molyneux ME. Retinal findings predictive of outcome in cerebral malaria. Trans R Soc Trop Med Hyg 1996;90:144-6. Lewallen S, White VA, Whitten RO, Gardiner J, Hoar B, Lindley J, et al. Clinical-histopathological correlation of the abnormal retinal vessels in cerebral malaria. Arch Ophthalmol 2000;118:924-8. Beare NA, Southern C, Chalira C, Taylor TE, Molyneux ME, Harding SP. Prognostic significance and course of retinopathy in children with severe malaria. Arch Ophthalmol 2004;122:1141-7. White VA, Lewallen S, Beare NA, Molyneux ME, Taylor TE. Retinal pathology of pediatric cerebral malaria in Malawi. PLoS One 2009;4:e4317. Lewallen S, Taylor TE, Molyneux ME, Wills BA, Courtright P. Ocular fundus findings in Malawian children with cerebral malaria. Ophthalmology 1993;100:857-61. Idro R, Karamagi C, Tumwine J. Immediate outcome and prognostic factors for cerebral malaria among children admitted to Mulago Hospital, Uganda. Ann Trop Paediatr 2004;24:17-24. Kochar DK, Saxena V, Singh N, Kochar SK, Kumar SV, Das A. Plasmodium vivax malaria. Emerg Infect Dis 2005;11:132-4.